To an outsider, French politics can appear incredibly confusing. As the country prepares for a new presidential election to be held on April 23 and a runoff on May 7 2017 in the context of an extended State of Emergency since Nov 2015, one is entitled to wonder whether a so called Democracy à la française is any different from its American idol. Actually, President Trump’s inaugural speech delivered the answer loud and clear: “For too long, a small group in our nation’s Capital has reaped the rewards of government while the people have borne the cost. Washington flourished- but the people did not share in its wealth. Politicians prospered- but the jobs left and the factories closed. The establishment has protected itself, but not the citizens of our country. Their victories have not been your victories. Their triumphs have not been your triumphs; and while they celebrated in our nation’s Capital, there was little to celebrate for struggling families all across our land”. Undoubtedly, his message will be remembered in history as one of the kind. Not only was it describing the fight for survival in one particular nation, but while these words of freedom and patriotism were floating in the air, it was also embracing all the sufferings of hundreds of millions of Europeans. When President Trump mentioned a small group in his nation, he was also pointing at the small gathering of happy few that for the past twenty years +, voodooed and enforced globalization to their sole benefits while more and more of their respective fellow citizens were losing their jobs, homes and were forced to live on food stamp. In other words, an international oligarchy- with his best former leaders being sit in a small distance- was finally uncovered. All of them were finally “named and shamed” before the eyes of all democratic nations. Meanwhile, as Donald Trump isn’t deprived from exquisite manners and rare skill for subtle irony, he simply paid a tribute to President Obama and First Lady Michelle Obama’s “magnificence”. The rhetorical exercise was perfectly mastered and the point was made: a biased political correctness era had just come to an end, as millions of forgotten ones were finally set free. Indeed, at this very moment, President Trump was their miracle taking place on Capitol Hill. Indeed, the U.S. history was in the making. Indeed, the unusual and successful businessman suddenly appeared- more than ever before- their untamed hero. But actually, he was more than that. 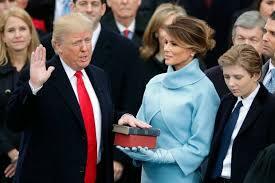 Above all blessings, songs and glory -after two years of a restless fight against an international empire that had grown stronger than any state power – the victorious 45th President of the United States entered in the American history as the hero of a “Brand new world”. He had fought like a lion for his belief in a true Democracy. He had fought for a righteous idea he’d been taught in his childhood: “No tyranny can last forever”. The immense French writer, gifted poet and virtuous politician Victor Hugo shared this humanist vision. Yes indeed, on the shores of the new continent, the “carnage” was stopped “RIGHT HERE, RIGHT THERE” for the American people. It was swiftly blown with the wind, as Millions across the old Continent envied and rejoiced for their American brothers’ blessing. 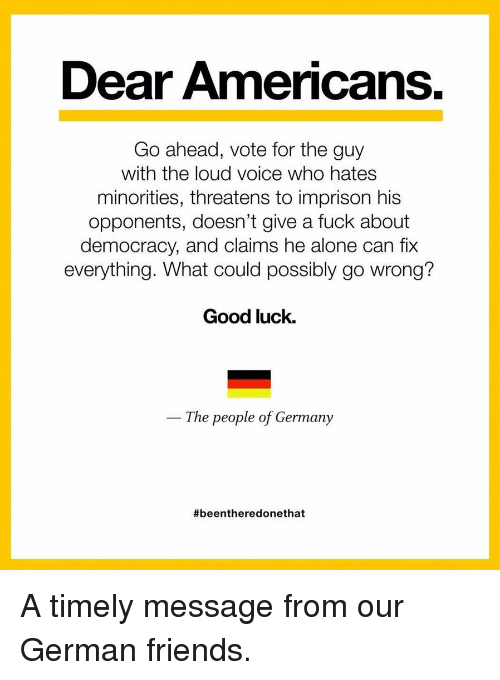 In France, in Germany (Sept), as well as in several other European countries, major elections will be taking place this coming year. Be assured of the whole-hearted American support that will be whistling in your ears all along: “disguised dictatorships must be blown with the wind”. The British people showed the path. Last Saturday, an unprecedented meeting of Europe’s rightwing populist parties was held in the central German city of Koblenz. Organized by Marcus Pretzell, a leader among Germany’s Alternative für Deutschland (AfD), he chanted the slogan: “Freedom for Europe”, as France’s far-right presidential candidate Marine Le Pen (FN-Front National) declared to an enthusiastic applause of several hundred: “2016 was the year when the Anglo-Saxon world woke up. I am positive that 2017 will be the year when the people of continental Europe will break free. Brexit unleashed an unstoppable will”. Also present, Geert Wilders, the Dutch leader of the PVV who had promoted the meeting on his Twitter feed using the hashtag #WeWillMakeOurCountriesGreatAgain – a wink to Trump’s promise – made his position clear. He doesn’t support “a system of oppression of the peoples”. Repeatedly fueled with Islamic funds, the international oligarchy’s retaliation was immediately appalling. As soon as the first day on Donald J. Trump’s presidency, as many as 20 + anti-Trump marches were reported happening around the so called “free world”. For instance, in France- this other merry land of freedom for the people, land of humanism and brotherhood where 10 over 66 million citizens live below the poverty line and 54 just above- the entire mainstream media including the state channels made sure to focus quite exclusively on an astonishing demonstrations’ coverage, while diffusing the most dishonest commentaries. Here is the vicious circle that one has to understand. A/ Industrialists, including Jewish ones, own the French mainstream media. Furthermore, from the far left-Communist party (LFI) to progressive liberals [Manuel Valls (Social-dem party)/Emmanuel Macron (En Marche)] up to liberal conservative former PM François Fillon, the political class has continuously mocked Donald Trump. They were certain of Hillary’s victory and voiced their strong preference in many occasions. This said, both the successive French governments and industrialists have been fueled with generous Islam funds for decades. B/All through the American presidential campaign and yesterday was no exception, the mainstream media invited corrupted and politically oriented so called U.S. specialists. One was a personal friend to Hillary Clinton. Another one was a racial rights activist. A journalist was Facebook-France CEO’s wife….The result was calamitous. Donald trump’s supporters were constantly depicted as racists, sexists, pro KKK, uneducated losers…and the United States they repeatedly described had little to do with reality and everything to do with Fake news. Trust me on that one. C/ This bunch of people “pile of garb….” is proudly Pro-Islam, pro-globalization, fiercely pro-European and most of the time anti-Zionists. Now, to the benefit of the French audience, here is what was kept silent yesterday and should have been told as a fair and balanced comment on the women’s rights march occurring in D.C.
Linda Sarsour, one of the women’s rights march organizer was lately described by President Obama as “a champion of change, a working woman, community activist mother of three, an ambitious outspoken and independent feminist that shatters stereotypes of Muslim women while also treasuring her religious and ethnic heritage”. President Obama obviously forgot to mention that she is a strong supporter of the Sharia law (the Islamic law) and Hamas terrorist organization. Nationwide, she is one of the most influential coordinator for the National Network for Arab American (NAAC), a network of 22 Arab American organizations in 11 states including the District of Columbia- where she conducts training on the importance of civic engagement in the Arab and Muslim American community. Locally, she serves as the Director of the Arab American association of New-York, a social agency also serving as Muslim immigrants’ rights advocacy. Last December, during the Muslim American Society and Islamic circle of North America (MAS-ICNA) annual Convention held in Chicago, she was spotted posing with Salah Sarsour, a former fundraiser for Palestinian terrorist group Hamas who was named in a 2001 FBI document as a money man for the Holy land Foundation for relief and development (HFL), a Texas-based group that served as a financial conduit for Hamas. At the convention, he was seen wearing an ear piece, serving as body guard to Sumeyye Erdogan Bayraktar, Turkish President-dictator Erdogan’s daughter. It is unclear whether Salah and Linda are related (although they share the same name and happily posed together). So if I get it right, the French mainstream media turned this questionable woman into the superb symbol of women’s rights, while suggesting ignominious parallels between Adolf Hitler and President Donald J.Trump on the ground that his inaugural speech was an unfriendly message to U.S. traditional allies. Indeed, the improper comparison is laughably wrong. As mentioned before, President Trump’s speech was a vibrant tribute to the peoples of the free world. It was a loving wakeup call showing his concern and human vibe. Whereas crybabies sore losers have nothing left except fake news and bad plots to peddle, Donald Trump’s heart beats the pulse of the human heart. The echo of freedom has touched and moved all men of good will and common sense, wherever they could be found in the world. This unique echo is unstoppable and immortal. That’s precisely what has killed an international oligarchy which had thought it could reign for ever. The peoples don’t demand much, but they certainly demand to live in dignity. The French audience would have deserved to be remebered this unbearable truth. From January 20th 2017, what could go wrong indeed? More fake news from mainstream media? More Islam funds dedicated to Identity, racial, religious movements activism, Education, Environmental/climate change industrialist lobbies? Then, if Islam countries pretend they support diversity, humanism and environment issues, why don’t Islam countries begin with greeting asylum seekers who share their religious and cultural values? What else could go wrong? Anti-patriotic industrialists gathered in Davos summit ready to rally behind China? Could we think of some EU leaders’ conspiracy which would try to jeopardize better relationships between Russia and the United States? All options are on the table. However, anger among the European people has reached a paramount. While Donald Trump is compared to an unsteady new dictator in America, the European populist parties are alleged to be a Nazi organization. Quite ironically, in repeatedly refusing to accept a Brexit-like referendum allowing peoples to choose their own destinies, the leaders of the European Union have shown their innate contempt for democracy. If asked, the European peoples would demand an immediate referendum. In 2005, they were asked and answered NO to the European Constitution. Two years later, the Treaty was implemented without their consent. So my questions to you will be the following ones: What would you suggest to the peoples of Europe and how Donald Trump should deal with European dictators?